Now we are embarking on an ambitious two year programme of scientific research using data from Bird Atlas 2007–11. Help us to go 'Beyond the maps' to analyse this wealth of data to understand the driving forces behind our changing bird populations. Support the 'Beyond the maps' appeal and help fund vital research to discover the answers to pressing conservation questions. 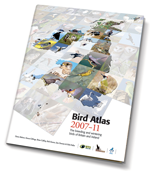 With your help we were able to raise £1,400,800 to produce the Bird Atlas 2007-11. A huge thanks to everyone who has supported Bird Atlas 2007-11, particularly Joy and Ted Danter for their major legacy, all the Charitable Trusts, the 238 Species Sponsors and tremendously generous Members, BTO Garden BirdWatchers and supporters. The field work for Bird Atlas 2007-11 alone took four years and involved an estimated 40,000 volunteers. There has been tremendous support from bird clubs with 45 local atlas projects run alongside the Atlas. More than 50 photographers have contributed to the book and staff from BTO, BirdWatch Ireland & the Scottish Ornithologist's Club have helped to collate data, carry out analysis and write and oversee the production of the book. The wealth of information the Atlas contains about the changing fortunes of over 300 species will inform the conservation of birds in Britain and Ireland for the next decade at least. Take a look at a sample of the pages and buy the Bird Atlas 2007-11 book.